It is an oft-repeated maxim that the Law of Diminishing Returns applies to Hi Fi Improvement, as everything else. 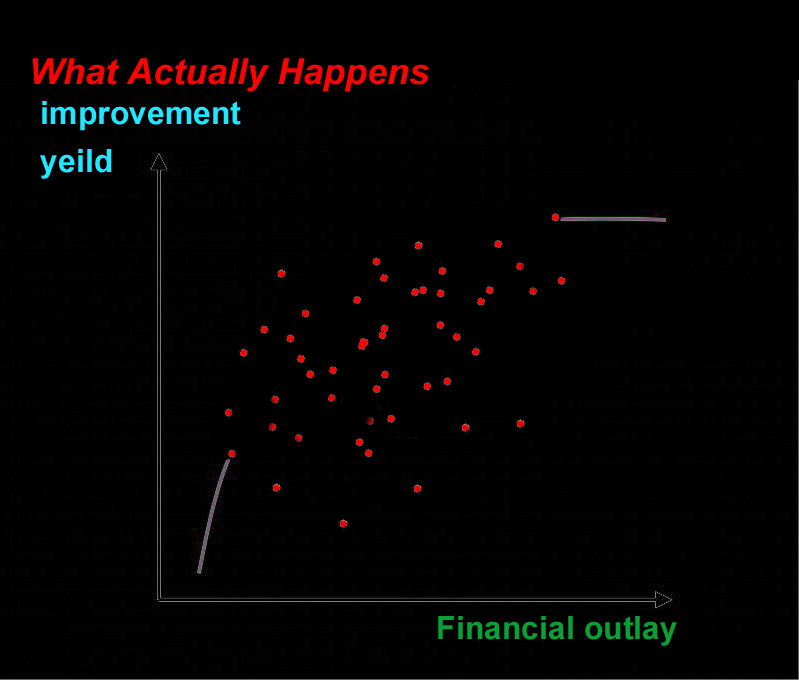 It takes more and more money to yield smaller and smaller improvement. It sounds logical, persuasive and you accept it as a price to be paid for improvement. It’s like an immutable law of Physics. A lot of our thinking, and action, is based on this sort of received wisdom, borrowed from other fields of endeavour. 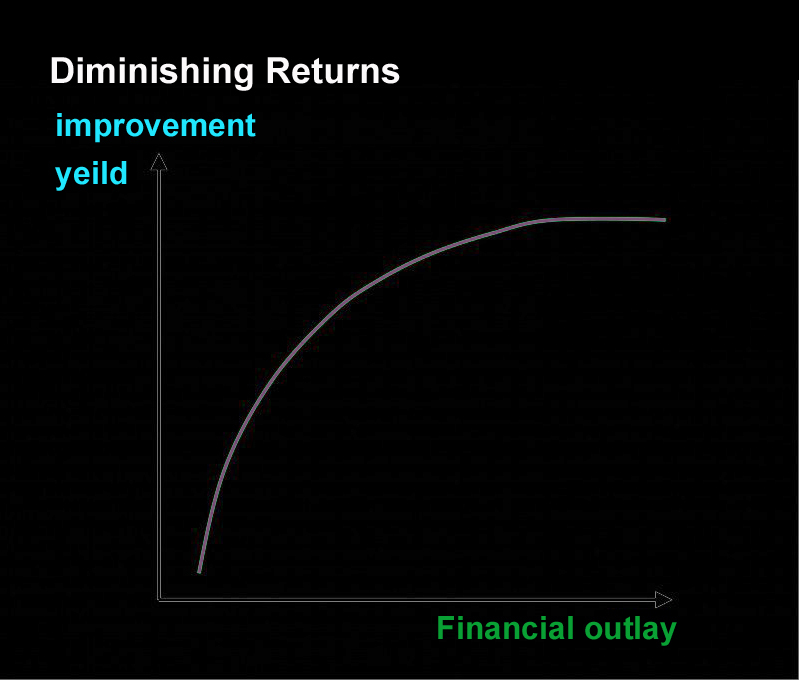 The model of Diminishing Returns – a gently flattening curve between cost and improvement – has no basis in fact. The relationship applied to Hi Fi is, in my experience, entirely random. A small expenditure can make a huge difference, absolutely no difference or perversely, make things worse. A large expenditure can make a momentously huge improvement many times its expected “diminishing step”. Equally a very very expensive improvement can have a crippling effect, sending the curve plunging down instead of up. How is this to be explained? I don’t really know but I suspect it is because a real Hi Fi is a highly complex set of poorly understood relationships (as opposed to a “model” of how HiFi works). No-one has the time or resources to try everything, everyone’s system is different. If outcomes are unpredictable or worse even random, no-one knows any longer knows what to do. Diminishing Returns is simply a bad model that fails to explain what happens, however everyone is very comfortable with it – both those that buy and those that sell Hi Fi – because it offers the illusion of control over outcomes in an uncertain world, in exchange for money. Normal feelings of vulnerability in the face of the unknown translate into fear of being exploited by tricksters, which a psychologist would recognise as a projection of people’s feeling of insecurity, not based on experience of being tricked. Few if any businesses would survive long based on “trickery”. Reading HiFi Forums you also come across a pernicious form of inverted snobbery – how cheaply something can be done – buy speaker wire from d.i.y. stores – and mock”the gullible” who fall for expensive hi-fi tricksters. Hi-fi is doubly uncertain because of component inter-dependencies, especially “hidden” dependencies like electrical power. Component A may be holding back the performance of component B, and both could be held back by the power to component C. You won’t hear how good A is until you fix C.
Many “improvements” are unpredictable in their magnitude and can be unexpected in their direction.Welcome to the world of trial and error, just listen to what happens. Most sellers will talk up benefits. Why wouldn’t they? The sales patter may be true or it may not. You don’t have to believe or disbelieve, just try it. You don’t have to know, it doesn’t help to anticipate what ought to happen – expectation bias and confirmation bias are a big problem in assessing change, and interfere with your judgement. I recommend you embrace the principle of uncertainty, and cultivate your own expertise at listening. Uncertainty is the substance of life. I wouldn’t want to be without it. Of that I am fairly certain.